Even though I write cook books, have two food blogs and have an online cooking school, I didn’t start out being a confident cook. When I first got into cooking I was in my early 20s, living in Sydney, working in my first job as a Food Scientist developing new snack products for Kellogg. I used to spend hours pouring over magazines and cookbooks deciding what to make and compiling lengthy shopping lists. Then I’d head off all over town. To my favourite veggie shop or the farmers market. To my butcher, the deli, sometimes to Chinatown and a stop at the supermarket for staples. While I enjoyed these excursions, they weren’t without their frustrations. There would often be one or two ingredients that were sold out or I just couldn’t find. Since I didn’t have a clue about ingredient substitution, I’d have to go to multiple stores trying to find what I was missing. Slowly, over the years, I got better at the whole process. As my cooking confidence grew, I started knowing which ingredients I could skip or substitute. My food bills came down and my ingredient waste decreased. The biggest game changer came when I was living in the beautiful Barossa Valley, Australia’s equivalent of Napa. As a young wine maker, most of my waking hours were spent in the winery. I no longer had time to plan my meals in advance or much time for cooking. The highlight of my week was the Saturday morning Barossa farmers market. I’d grab a coffee. Then I’d wander around tasting, chatting to the farmers and buying whatever took my fancy. I wouldn’t have had time to make a list so I’d just buy what looked good. When I got home, I’d figure out what to cook based on my market bounty. Sometimes I’d consult my cookbooks. But often I’d just make things up. I started really cooking from the heart and cooking with the seasons. And better yet, I was able to feed myself really delicious, healthy meals that took a fraction of the time. I came to realize that just as we can all learn to cook with a recipe, we can also learn to cook without them. It’s easier than you think, if you have the right guidance. I’ll be going into much more detail on how you to can become someone who cooks without recipes the week after next. What is the most common meal planning mistake? Basically, it’s following the traditional meal planning method. You know, deciding what to cook in advance and then building your shopping list around that plan. First, it takes a lot of time to plan in advance. Trawling through recipes and writing detailed shopping lists. Having a set list means you aren’t free to choose what looks best (or cheapest!) when you’re shopping. They also lack the flexibility to cope with the changes that naturally come up with modern life. You just need to learn how to ‘reverse’ the process. It may sound scary, but in practice it’s a liberating approach to meal planning. And it’s actually much quicker and easier than traditional meal plans. I’ll be sharing you my Easy 3-Step Framework for avoiding this meal planning mistake next week. It’s all about how you can learn to shop first and then cook based on the ingredients you have in the house. What it would be like if you didn’t have to plan ahead? How would it impact your time? Your health? Your waistline? Your energy levels? Imagine coming home after a long day and cooking dinners you truly enjoy without repeating the same dishes over and over. Imagine not buying a bunch of ingredients that ultimately go to waste because your schedule changed. Imagine revolutionizing how you cook and growing your kitchen confidence! If you’re an experienced cook, imagine avoiding the trap of taking on weeknight meals which are too complicated for your schedule and energy levels at the end of a long day. Imagine being able to listen to what your body needs, rather than what your meal plan says. Imagine not following recipes to a ‘T’ anymore – being able to substitute ingredients based on what you have. Imagine wasting far less food. Imagine being able to look in fridge and pull together a healthy meal with ease. This isn’t a crazy dream. Next week I’ll show you how to turn these dreams into reality. I’m going to give you a clear, 3-step framework to help you stop making the biggest meal planning mistake and reverse your meal plan. I want to live in a world where eating healthy, home made food is the norm. Where most people are able to just walk into the kitchen and throw something delicious together. Where cooking dinner is seen as a joy and a privilege not another chore at the end of a stressful day. ps. I’d love to hear from you! How would your life change if you were able to reverse YOUR meal plan? Let me know in the comments below. The way I think my life would change if I just bought what looked good and went from there, is that I think I would probably be somewhat bored with the food. My husband tends to cook that way, with a meat, a starch and a veggie. He cooks one week out of every three, and I enjoy the time off, but prefer to have foods that are a little more interestingly flavored. It might help if we had farmers markets locally, but that is a non-happening since we live in the desert. My solution has been to continue planning – I have an app for that, which allows me to re-plan while shopping – and then go for more of the simpler recipes (like your 5-ingredient ones). What has really helped me with both planning and enjoying cooking, is having my husband cook on a regular basis. That has rejuvenated me. Interesting that you think you’d be bored Susan… just because you’re cooking with what you have doesn’t mean you aren’t allowed to use herbs and spices and play around with different formats for meals. I certainly don’t follow your husbands formula! It sounds like your lucky to have that 1 week off! Jules, just wanted to thank you for something that you may not realise that you have taught me and others. When I first started following Stone Soup I loved it mainly because of the variations and swaps that you had at the end of each recipe, so I could make it lactose free, low carb, vegetarian, whatever. But I often thought, where’s the rest of the meal? I have come to realise that I over cook. I don’t just do a roast on Sunday, I do a roast with perhaps 7 different vegetables, and home made gravy and perhaps cauliflower au gratin and then I am exhausted. You have taught me, and I see this trend in cooking magazines now as well, that you don’t need the whole kitchen sink with every meal. It takes the pressure off me as a cook and it means that we savour what I’ve cooked. I will cook pumpkin or cabbage and peas but I don’t cook parsnips, carrots, potatoes, au gratin, the kitchen sink as well. And the family are fine with it. I think I was just doing what my mum did and it just isn’t necessary, it is also cooking as you suggest above the traditional way but my mum was also a stay at home mum and I work outside the house all day so my time is much more limited than hers was in terms of planning and shopping, preparation and cooking. I mix it up with Veg at different meals but I don’t need to cook every damned vegetable at every damned meal for it to be edible or delicious. This also helps with the shopping , there’s much less waste in my fridge, it’s cheaper and less stressful. Yay! Thanks. It’s such a relief to read your post! I have never in my life been able to sit down and plan a week’s meals, or even a few days’. I can plan a special meal down to the last detail – for example a celebration or when I invite friends for a meal, but ordinary everyday meals, no! Too much time consuming effort! I have always done as you said, gone to the market or supermarket and looked around for the best things in season, or special bargains and built my menus round that. I felt rather inadequate and guilty, but now I realize I was doing it right all along – for me, at least. Thanks! OMG Sue … 11 children! You are amazing! I can’t imagine being able to cope with any more than my two. Can imagine that experience was invaluable for learning to be resourceful. And thanks for spreading the word about Stonesoup… I need more readers like you! YES! This is what I’ve always wanted to be….being able to cook without recipes, with whatever’s available, for my fussy family of 5. Simple, minimal, fresh, flavorful and healthy cooking is my goal. My daughter can’t have dairy/egg/gluten so I have to cook with these constraints. I already cook mostly without recipes (though I have a whole shelf of gorgeous cookbooks!) but it would be wonderful to learn how to improve my cooking further. I can’t wait to see what you have up your sleeve! Sounds like you’re doing well Julia! You might like to try using your cookbooks for inspiration for techniques / flavour combinations and then try and break them down into template recipes yourself…. or you can join us in my new program where I’ll walk you through how to do this. I have such terrible confidence in the kitchen and feel like I need a recipe to cook every single time. I beat myself up constantly for either not finding the time to meal plan or failing horribly at sticking to the plan I so painstakingly devised. I really love your approach to cooking Jules and I desperately want to become a confident cook who actually enjoys creating meals for my family rather than dreading every meal time and feeling like I’m chained to the kitchen bench. I’m making a ‘3/4 way through the year’ resolution to choose to become a more confident cook rather than whinging about it all the time! 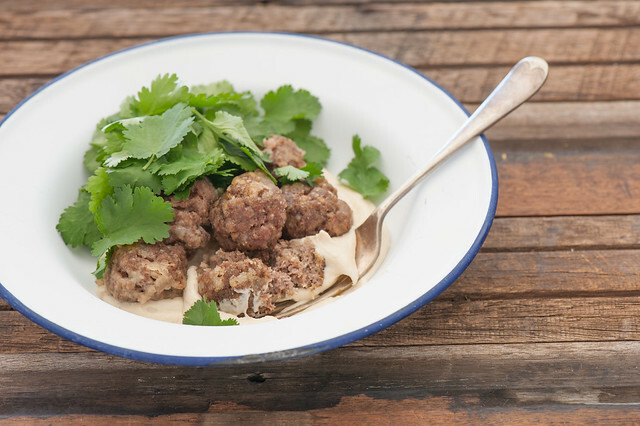 I just read through your recipe for the beef and caraway kofta and I am totally going to make that tomorrow. I find your variations at the end of the recipe so helpful – I go from thinking ‘oh can’t make that one’ to ‘oh brilliant! I’ll give that a go instead!’ – it really sets you apart from other cooking sites.